Almost everybody have a Ukulele tuner because they have a phone, and a possibility to download apps. But there is also other methods. Before you can enjoy your Ukulele to play good Ukulele songs or just Ukulele chords progressions, you need to know how to tune your Ukulele. So – how to tune a Ukulele? The simplest way to do this is with help from a Tuner. You can by a Tuner in shops that will help you to Tune. It is several types of tuners, but the most common type to day is a Clip-on tuner that you just clip on to your Ukulele for tuning. The prices are about 10$ and up. It is a very convenient way to do it. If you have an electric acoustic Ukulele it is often supplied with a tuner along with the controls for the sound. This is great help to keep the Ukulele tuned. An even more inexpensive way is to download a tuner to your Smart phone. Normally you can find a free version for iOS, Android and Windows. They are normally very good and easy to use. You always have with you your phone and then you also always have your tuner. Free versions of Ukulele tuning app often come with some advertisements. 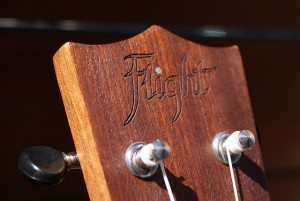 Before you start you need to know what kind of Ukulele you have (See article: Ukulele Types). Standard or soprano Ukulele: the most popular tuning is C-tuning: G4 C4 E4 A4. The re-entrant tuning is when the G string is an octave higher. Concert and Tenor Ukuleles also can have a “Canadian tuning”. The name comes from its use in the school system in Canada. This is a D-tuning with a low 4th. A3 D4 F#4 B4. Se the Ukulele history. Sopranino, soprano and concert Ukuleles have most often re-entrant tuning, while the “lower pitched” instruments as tenor, baritone, bass usually have linear tuning, where the strings are tuned from low to high pitch. For detailed explanation for tuning all kinds of Ukuleles see the article about Baritone Ukulele Tuning.